The Laser Hot Hits website is having technical difficulties at present. Normal service will resume soon! Broadcasting to the world on good old Short Wave. 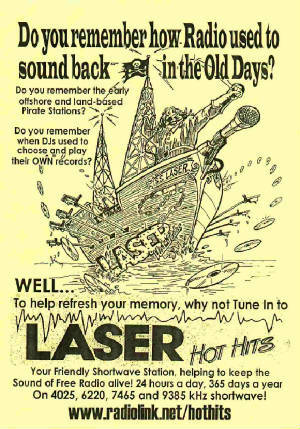 Laser Hot Hits brings to you everything from Rock, Pop and Oldies to Dance and R&B. Listening online is now easier then ever! Just click the Listen button below. Clicking the button below will open your default mp3 media player (normally windows media player) if a download box appears just click on "Open"